For its part, Solano says of Santos’s unit that the battalion raised in early August 1944 set up its base in liberated Villeneuve-sur-Lot and took part in, among other operations, the liberation of three towns in Lot-et-Garonne (Tonneins, Agen and Fauillet). The guerrilla unit was posted to this last town at the beginning of September. The launching of the attack, scheduled for 10 January 1945, was delayed due to complications that had arisen in the battle being fought elsewhere: in the Ardennes. For that reason it would be a further three months before the order went out to close on the enemy positions in Festung South Gironde (northwest of Bordeaux), between the ocean and the river-mouth. The French and their foreign volunteers were confronted by formidable fortifications, with German troops sheltering behind them. In the spring of 1945 the Gernika and Libertad battalions were added to the forces on stand-by to attack the last two German redoubts (Festung) holding out in the Bordeaux area, on both sides of the Gironde estuary; Pointe-de-Grave-Soulac-Verdon in the far north of the Medoc peninsula (Festung South Gironde) and Roya on the coast (Festung North Gironde). In the illustration below showing GERMAN POSITIONS IN THE NORTH OF THE MEDOC PENINSULA, the defensive points described by Pañdeda are marked, numbered in accordance with the jargon and system used by the German engineers and military who erected them, the support points marked with a letter S (for Stutzpunkte) and the resistance nests marked Wn (Widerstandnester). Map: GERMAN POSITIONS IN THE NORTH OF THE MEDOC PENINSULA. 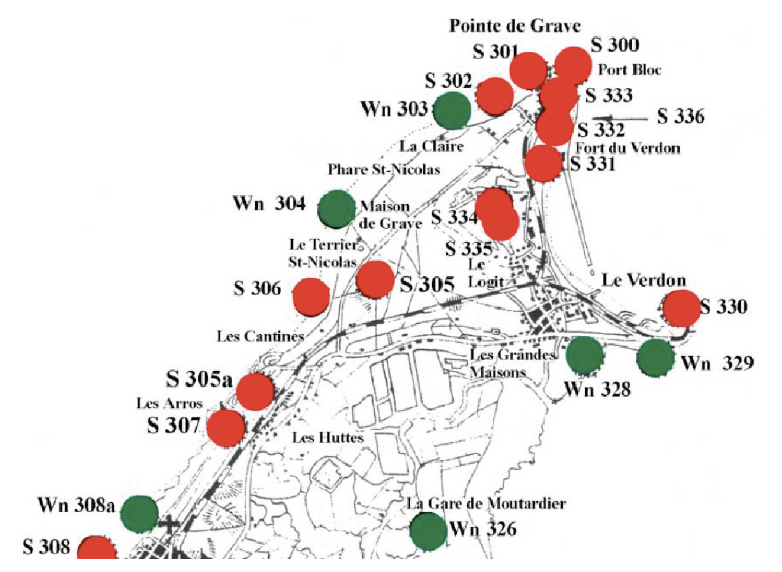 Support points in red and resistance nests shown as green circles. Many of these constructions were part of the Atlantic Wall, the mammoth defensive line that the Nazis built right around the western coasts of the European countries they had conquered (from Norway down to Hendaya-Irún on the French-Spanish border). 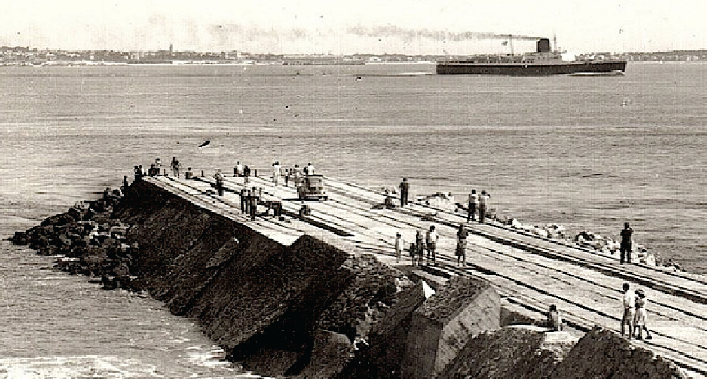 It was made up of an intricate network (blockhouses, command posts, artillery casemates, store-rooms, trenches …) specifically designed for control and monitoring purposes along the shoreline, with special reinforcement in strategic points such as river-mouths and port areas. Its purpose was to hold off seaborne assaults by the Allies, who, in the second to last year of the war (1944) had chosen France as the location for a massive landing that would open up a bridge-head for their armies into occupied Europe, the aim being to overrun Hitler’s troops and strike overland into the heart of Germany. Invasion, when it came, came on the beaches on Normandy, breaking through the front line and circumventing the defensive thinking behind the Atlantic Wall with regard to such faraway points as Festung Gironde, which had been designed to ward off outside attacks from the ocean rather than from the mainland. On the other hand, the correlation of forces in the Medoc following the liberation of Bordeaux and the laying of siege to the Festung – by an enemy that drew in fresh man-power and material whilst awaiting the word to go on the offensive – brought about changes to the defensive deployment available to the Germans. Thus, lots of coastal artillery pierces – which had previously faced out to sea or overlooked the waters of the wide estuary – had their emplacements altered so that they now faced the landward front line, a wide expanse of sandy ground and marshland separating the two sides. “… through the installation of dense mine-fields, bolstered somewhat later by an anti-tank ditch located behind them. Finally, a series of smaller lightly armed defences were erected by way of a third line of resistance. In front of this triple line of defence, which in theory marked the boundaries of the Festung, the Germans set up a foward line or Vorfeld marked by a line running from Montailvet, joining up with the Vensac canal and ending on the Garonne.” On the next map of the Medoc we can see the Festung-Gironde’s fortified areas on the Medoc peninsula, where the wide striped area representing mine-fields, barbed wire lines, machine-gun nests and other obstacles. At its southernmost end stands the so-called forward line or Vorfeld linking Montalivet (left and bottom of the map) with the river mouth (right). To the north, the stripes end at a line of defence with its anti-tank ditch crossing the peninsula from west to east. Within the area outlined by a darker line in the north of the peninsula lie the coastal towns od Soulac-sur-mer and Verdon-sur-mer, with Pointe-de-Grave occupying the northernmost point of the peninsula. 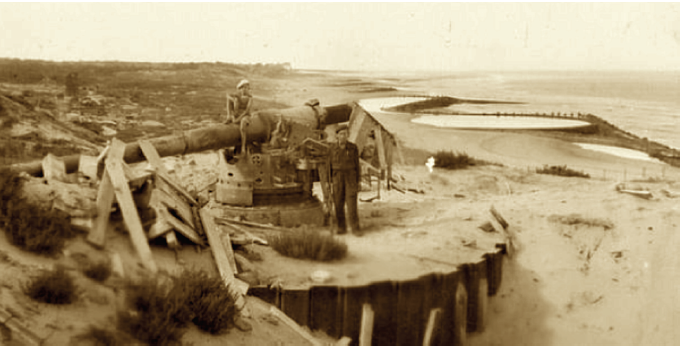 The shores washed by the estuary waters housed a military port and coastal batteries equipped with large calibre artillery pieces (with a range of 20 kilometres). 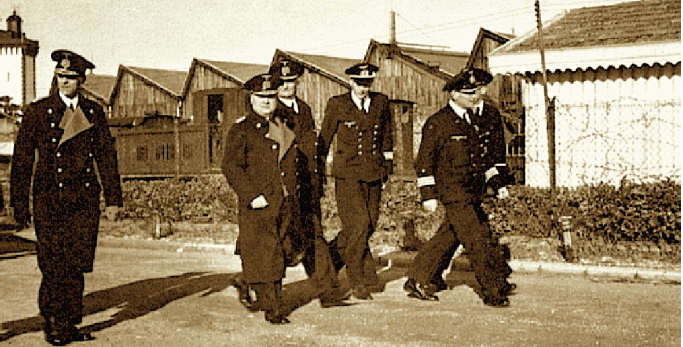 Further inshore auxiliary buildings were erected: billets, infirmary, warehouses, munitions dumps, radar installations, communications and command posts. Finally, defending the ocean side, there were the Atlantic Wall installations watching menacingly from the widespread beaches bathed by the waters of the Atlantic. In the sector where the Libertad and Gernika battalions would operating, Captain Fuchs’s Soulac-sur-Mer-based Festa LXXX was dug in. South of it there was Captain Portzold’s battalion of fusiliers with its command post in Grayan and there was also the ‘Narvik’ naval battalion based in Saint-Vivien-de-Medoc. The Asociación’s Facebook page also states that the latter were regarded by French historians as “elite troops always placed in the forward positions and who fought to the bitter end.” Their core was made up of the 536 survivors from the Z24 destroyer and T24 torpedo boat sunk on 24 August 1944 by Allied aircraft while setting out from Verdon-sur-Mer port. Those troops became the Narvik battalion which deployed two companies and a reserve unit made up of young sailors under the command of corvette Captain Birnbacher. 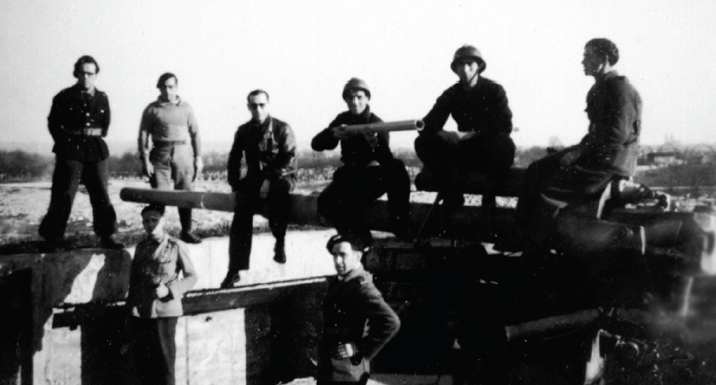 Birnbacher refused to surrender – even though he had had a message from his superior, Colonel Prahl, asking for an end to the fighting and he kept up dogged resistance from bunker S305 into which he had retreated with his men. In the end he surrendered after heroic fighting. The commanders of the German garrison were, one after the other, General Fritz Meyer, a Russian Front veteran an knight of the iron cross with oak leaf cluster; when he took ill, he was replaced in November 1944 by Colonel Christian Sonntag who would die in March the following year when a grenade blew him up; his replacement was Colonel Prahl, commander of the 582nd Grenadiers Regiment (Jersey) who was in charge of the fortress right up until operations ceased. 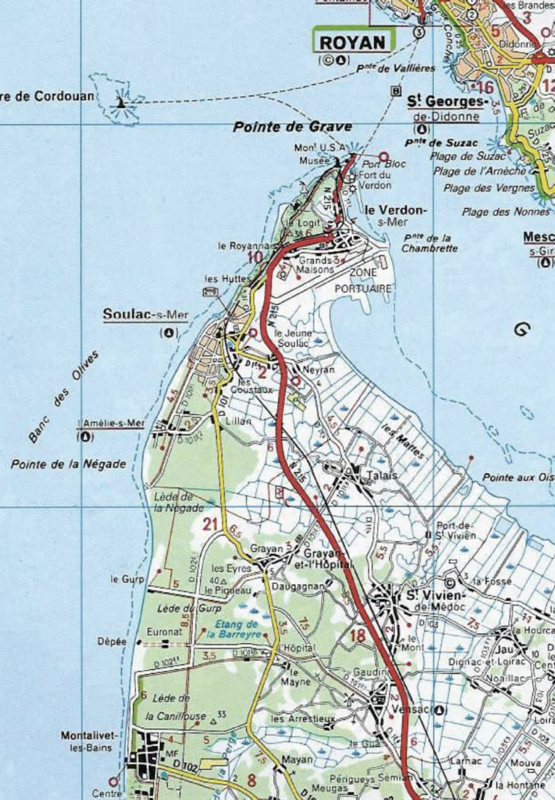 Map: The Medoc Peninsula. The superimposed outline of the Germans’ former defensive positions. 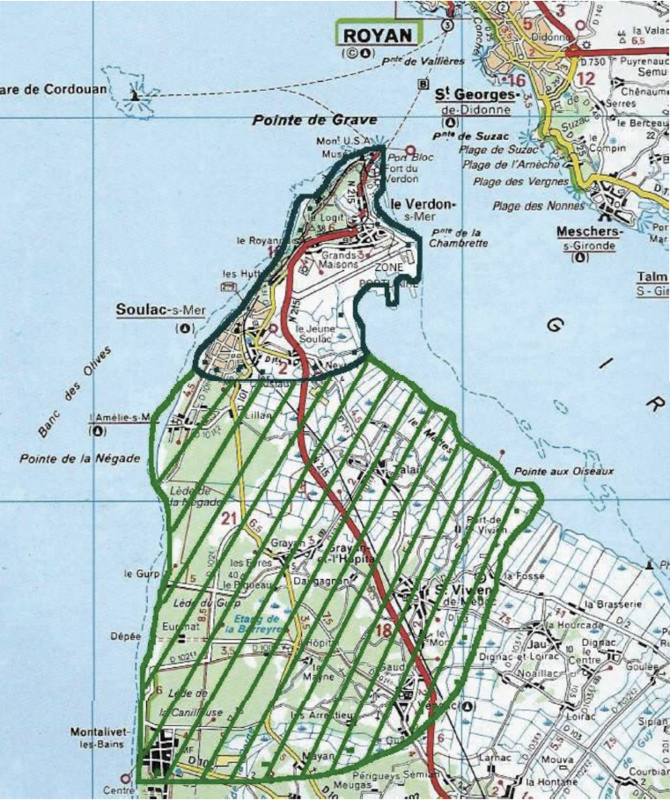 Map: A postcard showing an aerial view of the Medoc peninsula. 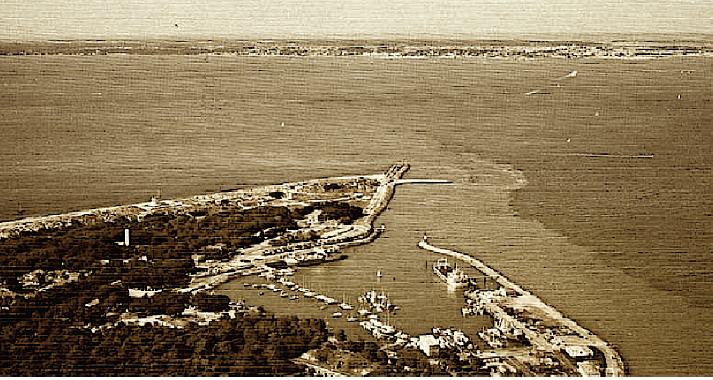 Picture: Postcard showing aerial view of Pointe de Grave and the Gironde estuary, with Royan on the landward bank. Oddly enough, it should be pointed out that the Asociacion Sancho de Beurko Facebook page refers to one instance of access by plane – a seaplane, as it happens – during the siege. Thus, when the commander of the Pointe de Grave German garrison – Eastern Front veteran General Fritz Meyer – was taken ill and his replacement, Colonel Christian Sonntag, had to be brought to the stronghold in November 1944, this was feasible through recourse to a seaplane. What we do not know is how the next and last commanding officer – Colonel Prahl – arrived when he took over from Sonntag; Sonntag died some months after landing there when he was handling a grenade in some forward positions on the front lines. The two combat units with which we are concerned ended up in the same military group as they were transferred into the Carnot Brigade commanded by Jean de Milleret (1908-1980), aka Carnot. De Milleret was a professional soldier born in Montauban (Tarn-et-Garonne department) who served in Indochina and in metropolitan France where he happened to be when Wehrmacht troops invaded in 1940; he was promoted to captain that year. Wounded and taken prisoner, he finally ended up in Vichy France where he established contacts with groups of resisters; he stood out for his tactical leadership. He took part in the liberation of Bordeaux and in driving the German troops into the far north of the Medoc peninsula. In March 1944 he was founder of the brigade that bore his nom de guerre (the Carnot Brigade), part of the French Forces of the West under General Larminat (1895-1962), who saw action in both world wars and was one of the very first French military men to join De Gaulle’s French Forces of the Interior (FFI). 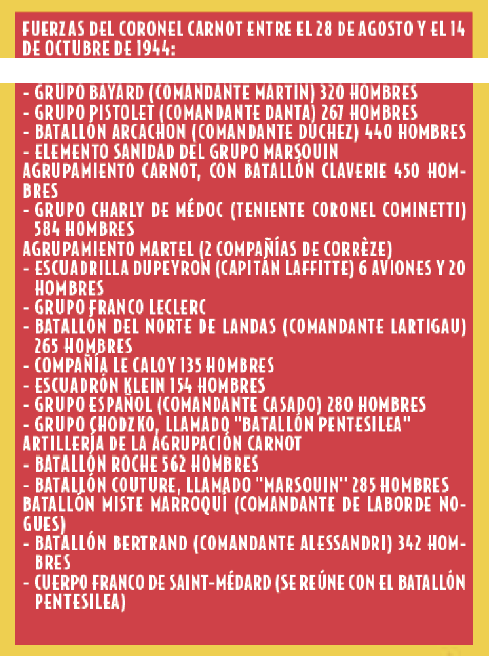 The brigade was manned by regulars, colonial troops and guerrilla groups from the Gironde and adjacent departments, including some of the maquis groups mentioned by us in our first instalment (The Libertad Battalion: Origins). 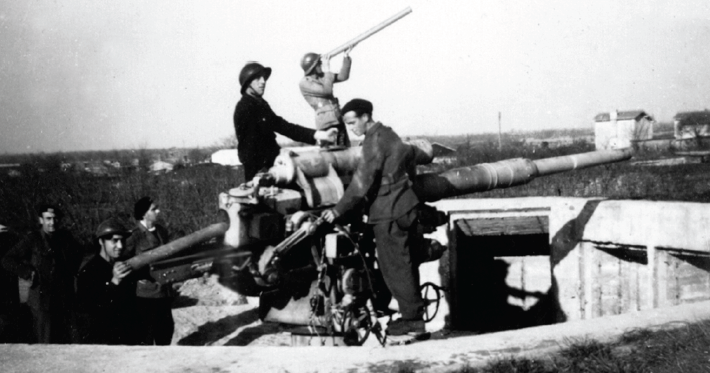 After he was appointed head of the FFI in the area under examination, what few men Carnot had at his command during the early days of the Liberation would become the protagonists of the initial phase of the Battle of the Medoc Front (which began in September 1941). In March 1945, by which time De Milleret had been made a lieutenant-colonel, fresh fighting units had bolstered the men under his command considerably, this being why they would be deployed in the final push against the German redoubt the following month, forcing the latter to surrender. Jean de Milleret, Carnot, who received significant decorations for his performance during the world war, had a military career that took him to Argentina where he retired in 1957 to devote himself to a career as a historian. In 1959 he was made a reserve colonel and in 1967 an honorary colonel. He died in Buenos Aires and was buried there. As we have stated, the anarchist guerrilla group whose trail we are tracing came – as did the Ordoki group – to serve in the Carnot Brigade, as part of General Larminat’s French Forces of the West. And they were attached to the 8th Mixed Moroccan and Foreigners Regiment (RMME), in which they made up the 1st Foreign Volunteer Battalion under the professional soldier, Colonel Rascle. The regiment’s other units were the 2nd Moroccan Battalion under Major Laborde de Nogués and the 3rd Mixed Battalion under Captain Brun (which mas largely made up of Italian ex-sailors from the Bordeaux submarine base). The 8th Regiment was under the command of Major Jan Chodzko, a native of Poland turned naturalized Frenchman. This descendant of the Polish upper aristocracy was a repeatedly decorated tough officer from the Foreign Legion. A career soldier – as well as a chronic alcoholic – he stood out on account of a limp that was not helped by an orthopaedic leg and the supervision and protection that he offered the fighting men under his command, most of them exiles without mastery of the language of the foreign land in which they were fighting. His stateless condition must have been a factor in his solicitude for his men and their reciprocation of that. The ‘Pentisilea’, so named by Chodzko in honour of the queen of the Amazons of Greek mythology. Was made up of 600 volunteers and had been raised in Talence (Gironde) in September 1944 through the banding together of a range of irregular forces from Bordeaux and was relocated to the Medoc area the same month. Like the Moroccan Battalion and the Saint Medard Corps Franc, it was incorporated into the 8th Mixed Moroccan and Volunteer Regiment (RMME), the unit to which the Basque and Libertad battalions were also assigned. 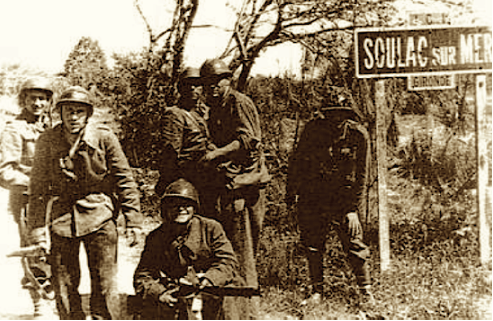 The Gernika and Libertad battalions’ skirmishing with German forces on the Médoc front began in the days leading up to the offensive and on occasion led to casualties – though not fatalities – the Asociación Sancho de Beurko Facebook page reports. After they had been deployed between Lesparre and Montalivet towards late March 1945, there was a serious incident after they detected a German patrol in the area. In the course of the ensuing engagement, a 50 mm mortar belonging to the Libertad exploded after a grenade detonated unexpectedly and Sergeant Manuel Gil from the Basque battalion was wounded. The operation to drive German troops out of the Gironde estuary and complete France’s liberation was launched weeks later. To this end, the Carnot Brigade – renamed as the Médoc Brigade – had been reinforced, now numbering “some 13,000 men, 31 artillery pieces and forty tanks. The air force had 62 French and 260 Anglo-American aircraft. A unit from the Navy was given the task of finishing off what the Allied aircraft did”, that Facebook page recounts. The push started on 14 April 1945, coinciding with the holding of an important rally in nearby Bordeaux organized by the political and trade union organizations of the anti-Francoist Spanish exiles. 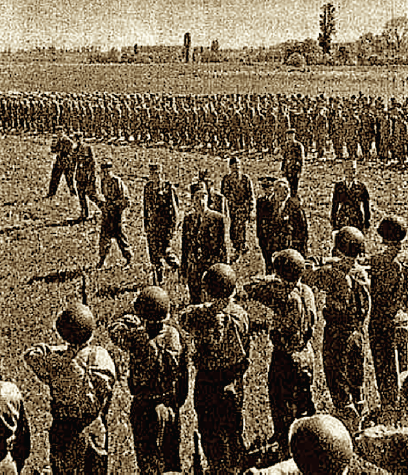 Following massive aerial bombardment – along with some softening-up fire from land and naval artillery – the Chodzko Regiment’s 1st Battalion of Foreign Volunteers received its baptism of fire. Even as public speakers of the calibre of the CNT’s Federica Montseny, the socialist Oriol Llopis and Wilebaldo Solano were railing against the Franco dictatorship, just a few kilometres away the fighting was under way that would end in a bloodbath for the Gernika and Libertad volunteers. 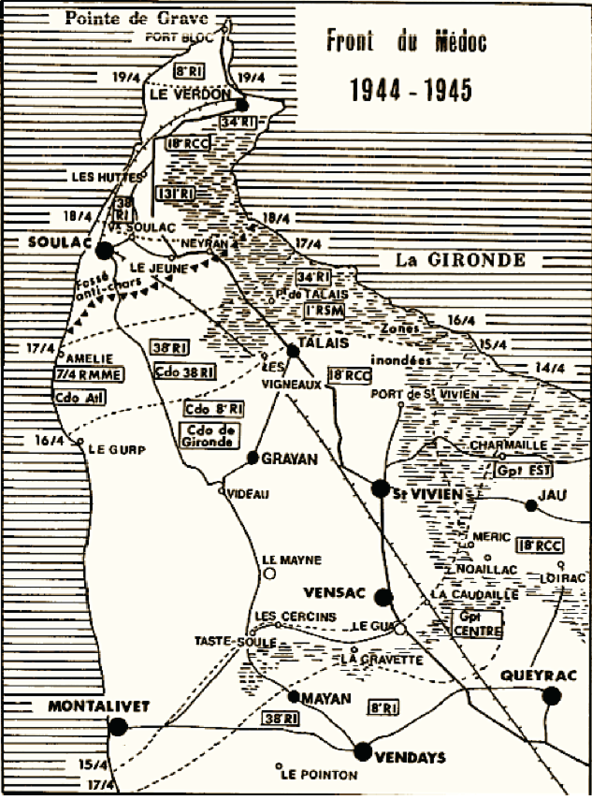 The French command posted the 8th Regiment to the western sector (the Atlantic Ocean front) and ordered it to drive overland, between the railway line and the Vendays-Montalivet-to-Soulac highway; these linked Bordeaux, metropolis and region, with the tip of the peninsula. Its mission was to reach Hill 40, so-called (close to the town of Montalivet) and wrest it from enemy hands. Beyond that military target lay the Atlantic Wall artillery positions. Not that the French command was expecting the operation to be a success immediately, since the area was heavily fortified, with four enemy automatic weapons sweeping a mined firewall that the men of Chodzko Regiment’s 1st Battalion had to cross. Some of the members of the Gernika (which was less than 200-men strong at the time the offensive started in April 1945) engaged, with their right flank being protected by the Libertad and their left by Moroccan troops. Once the Germans spotted them, the hail of fire unleashed left Ordoki’s troops,Santos’s men and the French soldiers with them with dead and wounded . Pinned to the ground and under threat from enemy fire, it proved possible to escape from the worrying situation thanks to the Libertad’s machine-guns which covered the retreat of their comrades-in-arms. Mario (or, in the account of another Basque who lived through the fighting, Mariano) González, a native of Bilbao who had enlisted in comandante Santos’s battalion, covered the retreat of the Ordoki fighters along with another machine-gunner from that anarchist unit. And lost an arm during the exchange of fire. Machine-gunner González, who survived the fighting but was left disabled as we have mentioned, settled in Bayonne after the war and ran a lottery office there conceded to him by the French government. Victor Laguillo, who was an adjutant with the Libertad Battalion, was less lucky; he was fatally wounded in the incident whilst trying to help a wounded comrade, when he stepped on a mine within the firewall within which the German troops were lurking. “The terrain was strewn with mines, but the advance pressed on in spite of the dogged enemy resistance. Heart-rending spectacle! The Basques ventured inside an area fortified by the enemy. Open targets, on they went, shouting Long live Spain! Long live the Basque Country! “15 April passed with no incident of note, the daylight hours being used for us to regroup and ready ourselves for fresh attacks. 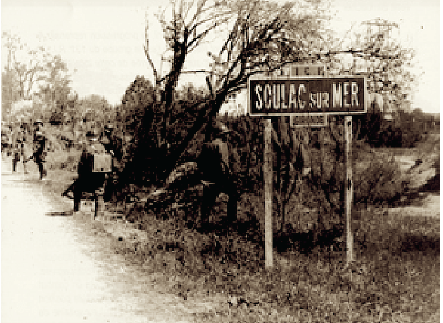 The 17th and 18th were spent by the 1st Foreign Volunteer Battalion to press on through the woods and marshes of the landward front, making for the coast in order to seize the Soulac-sur-Mer district (Saulat wrote in the paper). During the 17th there was another fatality, albeit that we do not have the name of the dead man, although his name no doubt features on the memorial to the dead erected afterwards on a beach in the town on the Atlantic coastline. =Photo: Troops from the Carnot Brigade in Soulac. “At daybreak on the 17th, once we had formed up, off we went in the direction of the sea. The operation was to encircle Saulat. Our lads followed the trail along the seashore after a long, hard trek across the sand, beset by the unwelcome attentions of a swarm of mosquitoes and weary with exhaustion. On this day, we took two Nazi redoubts from the enemy, with a single loss on our side. 18th: Today, after yesterday’s forced march, we arrived within five kilometres of Saulat. The order to attack the Gestapo’s bastion, packed with formidable concrete fortifications, is impatiently awaited by the comrades. Waiting for that moment to arrive, our guys rest from past exertions and muster on the road leading into Saulat. 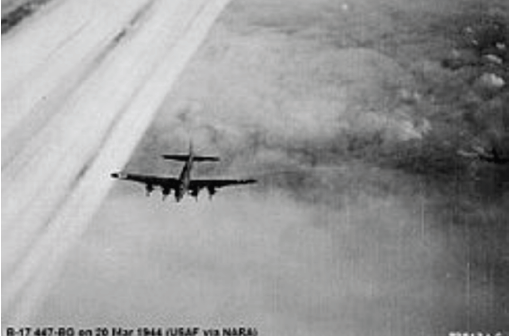 The attack on the enemy’s position is expected to begin around 15.30 hours. Come 15.10, the column’s heads are filled with enthusiasm and confidence. Our artillery has punished the enemy severely all morning long and the air fo9rce has also done sterling work. Other sources have information to offer us regarding how the fighting proceeded; like the one that mentions that as they got closer to Saulac they came under German artillery fire and were forced to fall back as far as the beach and spend the night in makeshift fox-holes in the sand. In the end they would enter the town, carrying out sweeps and mopping-up operations. And there are plenty of mentions – by Basque researchers – of the surrender to the Gernika Battalion of the crew of a dangerous defensive bastion (Blockhouse Y33) following the suicide of the officer in charge. Albeit that we have not been able to trace the blockhouse on the maps of the German defences or when, four years ago, we toured the coastline searching for Atlantic Wall ruins and vestiges of the battle. That day, the forces involved in the battle advanced in every sector along the tongue of land that makes up the Médoc peninsula. On the landward front and the front adjacent to the estuary shoreline the French and volunteer fighters from other units overcame knots of resistance, arriving in Verdon-sur-le-Mer. The town and its port facilities would be surrendered to Carnot’s encircling troops. “The toughest still lies ahead of us. The Germans have withdrawn to the shore defences to hold out until the last moment. After bitter fighting, one of our comrades manages to raise the Red and Black flag alongside the French one on the highest point on the coast, thereby concluding the capture of the position, to the wildest enthusiasm. It is 17.50 and lots of German prisoners have been taken. The clashes continued, with dozens of Germans captured after the battery surrendered. Albeit that there were losses sustained by the other troops under French command, such as the 16 dead and hundred wounded in the fighting for bunker S-305, defended by men under the orders of corvette captain Birnbacher. On the other hand, in its progress northward, taking ground along the coastline, the regiment’s units carried on taking lots of German prisoners after overwhelming the German defences. It looks as of the surrendering soldiers, frightened of reprisals from the French troops, preferred to give themselves up to their enemies in the Basque and libertarian battalions who refused to man-handle or shoot the defeated the way the French did. “Next, one section pressed ahead on the left flank, penetrating some four kilometres, as an advance was made along the right flank until they joined up, the operation being concluded with the capture of two new bastions wit two cannons and a machine-gun. On the 20th, at the far end of the peninsula where the last remaining Nazi redoubts were that were defying the onslaught, volunteers from the 1st Battalion, to an accompaniment of heavy air raids mounted by the Allied aviation (essential when it came to weakening German resistance) attacked the casemates and other enemy defences until these were forced into surrender. 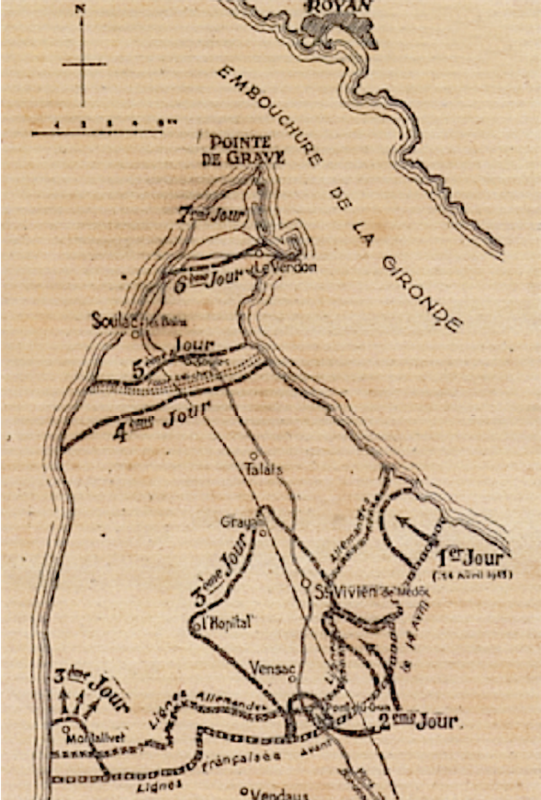 That same day, the rest of the forces participating in the offensive converged on captured Pointe de Grave. After a week of fighting, the combat was at an end. Although El Reporter in his contribution to the libertarian publication makes no specific reference to that day (the 20th) in the battle, he does describe the harshness of the fighting with which the Libertad Battalion had to contend and brings up another incident in which more men were wounded and he names the last fatality they sustained as Adjutant Bernardo Gallart (recorded as Baillard, B. on the Soulac memorial). “With the resistance from the ‘blockhaus’ overcome, a section from No 1 Company quickly pressed on with its advance along the left flank of the positions overrun. They were CNT members to a man. The advance was pressed to within a few metres of Pointe de Grave, held by the German command dug in there. Battle was quickly engaged. The German forces overlooked the position occupied by our section and trained intense machine-gun and anti-tank fire on our men. The response was not long in coming and the skirmishing assumed the scale of out-and-out battle. “The wounded were evacuated and the rest of the section held on to its positions until nightfall, at which time the ten remaining men were relieved by an entire French regiment. So ended that brilliant and successful day which left Pointe de Grave wholly liberated to a chorus of cries of victory to Spain and our beloved Organizations, leaving us to grieve over our dead who once more gave their blood unselfishly for the liberation of the towns. The Médoc has been liberated. — JUAN PINTADO”. Of the (roughly) 4,000 Germans who joined battle, 3,000 would have been taken prisoner and about 1,000 perished, many as the result of indiscriminate shootings, once the battle was over, shootings carried out by French troops taking revenge for the occupation of their country. The April 1945 offensive, deemed needless by historians in that the war in Europe was over within weeks with the expected result – Germany’s surrender – ended with 400 dead and 600 wounded between the French forces and their allies. The offensive might have had a purpose a year earlier when the Nazi garrison was a threat to access to the estuary, hobbling the delivery of supplies to Bordeaux’s port installations. But on that occasion an attack was ruled out, given the dearth of resources and man-power – poorly armed and crudely organized guerrilla groups – surrounding the besieged. Photo: After the liberation of German-held pockets, General De Gaulle reviews the victorious troops from the Royan sector in Mathes. But months afterwards, this reassertion of national identity counted for more than tactical necessity. Gaullist pride was not about to let the war end with enemy redoubts holding on, intact, on French soil and so, in the spring of 1945 – invoking France’s honour – he gave the order for the German bastions on both banks of the Gironde estuary to be taken: this offensive mounted in and around the Medoc was dubbed ‘Operation Venerable’. Mission accomplished, De Gaulle would attend the military parade by the units involved in the fighting. First of all, in Mathes, he reviewed the troops victorious in the Royan sector and then, after crossing the Gironde estuary, he joined the commanding officer of the French Armed Forces of the West (General De Larminat) at the makeshift airfield in Grayan on 22 April 1945. “In this sector, General De Gaulle had still to visit the little Medoc peninsula where a ferocious battle occurred. 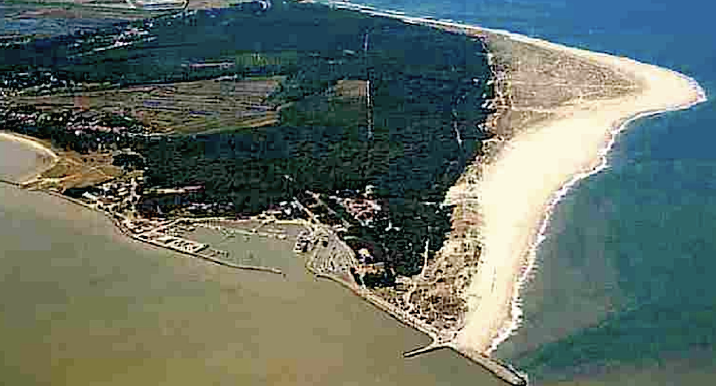 The river Gironde (actually an estuary, not a river – author’s note) was crossed in tiny reconnaissance aircraft. Through the window of the lead aircraft to take off the tall silhouette with its popular kepi with two stars could be glimpsed. Once more, as he had in Royan, De Gaulle reviewed the troops who had taken part in one of the last battles (on French soil) of the Second World War. During the ceremony he stood to attention in front of a republican flag carried by Santos, who blurry figure can be made out in the snapshot taken during the military gathering (just one of two photos of him which, as we have stated, seem to have survived) along with other members of the Libertad Battalion (just a few, as military formations and parades have never been to libertarians’ liking). Later, he would salute the Gernika Battalion’s ikurriña. 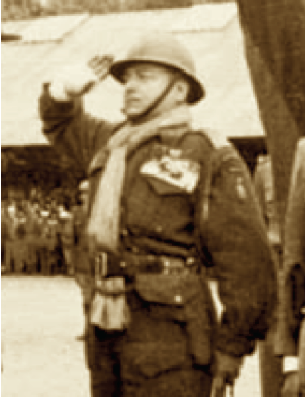 For his part, lehendakari Aguirre crossed the Atlantic from the United States, arriving in Le Bourget military aerodrome on 19 April in a US Army plane before setting off directly for Paris and then on to the Medoc, where, on 1 May 1945, he paid tribute to his countrymen from the Gernika. 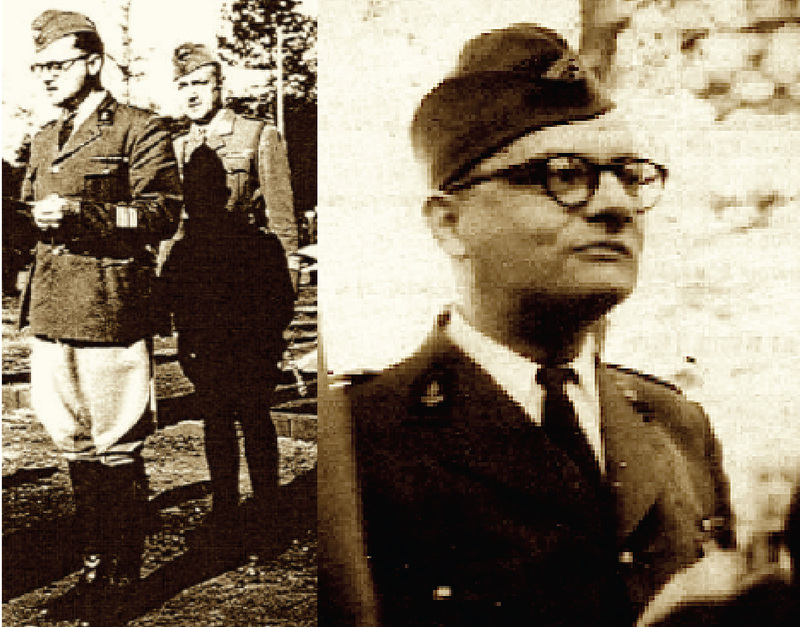 Earlier, on 3 March 1945, Heliodoro de la Torre had visited the Le Bousquet camp where Ordoki’s battalion was billeted prior to going into battle. 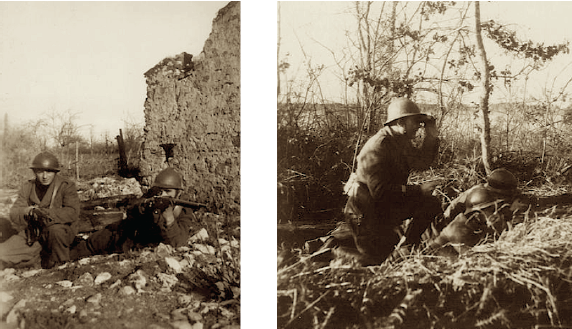 In this section, we are going to reprint two items from the exile press on the battles waged by the Libertad and Gernika battalions on the Medoc front in April 1945. 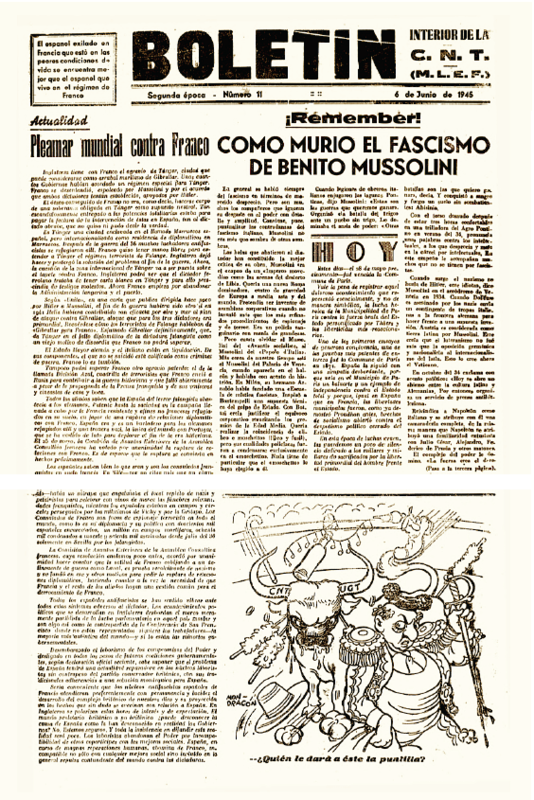 Both were published in successive issues of the BOLETIN INTERIOR de la CNT (MLEF – Spanish Libertarian Movement in France) in 1945. The first one, written in an epic, propagandistic vein, was written by Juan Pintado, a renowned CNT member operating in the ranks of the orthodox faction of the CNT in exile. Having played his part in reorganizing the Confederation in Toulouse he remained engaged with organizational life as it bounced back with a vengeance following the German retreat rom France. He attended the First Paris Congress (1945) and served on the committee tasked with drafting the motions that were passed. In March the following year, he was appointed to the National Committee of the FIJL (Libertarian Youth) at the 2nd Congress held in Toulouse. In 1960, when the two factions into which the CNT had split (the purists and the reformists) held their Reunification Congress, he was appointed inter-continental coordinating secretary. He further engaged in militant activity in the libertarian press, being a regular contributor to Solidaridad Obrera and director of Ruta. He also wrote, of course, for the BOLETIN INTERIOR DE LA CNT in France, one of his articles for which we are reprinting here. Having emigrated to Venezuela, he was director of the local newspaper in Puerto Azul. In the second case, the identity of the author of the account of the battle reported on page 4 of the June edition is not known to us, as he remained anonymous and used a pen name. This account – printed barely two months after the Medoc peninsula fighting, is the one we have used as the basis for our own account in earlier chapters of the ups and downs of the Libertad Battalion (and the Gernika Battalion) in the drive against Festung South Gironde. 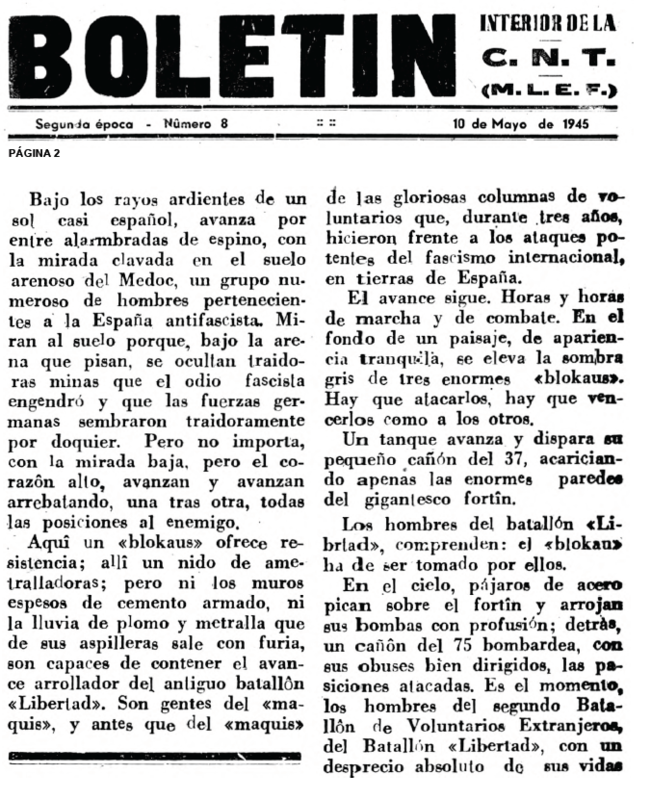 Now we reprint it in its entirety, including the dates for the incidents recounted to us by “El reporter”. 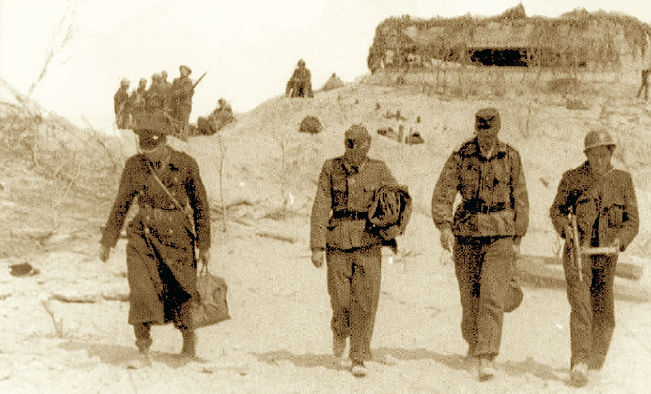 “Under the scorching rays of a nigh Spanish sun a large group of men drawn from antifascist Spain advances between lines of barbed wire, their eyes fixed on the sandy ground of the Medoc. They watch the ground because, beneath the sand upon which they stand, treacherous mines, the spawn of fascist hatred and which the German forces have treacherously and plentifully planted lie hidden. No matter. With their gaze low and hearts high, on and on they go, capturing, one after another, all the enemy’s positions. Here, there is resistance from a ‘blokhaus’; there a machine-gun nest; but neither thick walls of reinforced concrete not the hail of lead and shrapnel spewing furiously from within, can stem the onward march of the erstwhile “Libertad” Battalion. These men are from the “maquis” and, prior to the “maquis” from the glorious columns of volunteers that stood up to the mighty onslaught of international fascism on Spanish soil for three years. The advance presses ahead. Hours upon hours of marching and combat. Against the backdrop of a seemingly tranquil countryside loom the grey shadows of three huge “blockhaus”. These have to be attacked and overrun like the others. A tank moves up and fires a small .37 cannon, leaving barely a scratch on the huge walls of the gigantic fortress. The men of the “Libertad” Battalion understand: the “blokhaus” must be taken by them. Long live the CNT! Long live the UGT! The fortress is taken, the resistance overwhelmed and even as trailing column of Germans passes between rifles in the grip of Spanish hands, the advance presses on to within eight hundred metres of Pointe de Grave. Fifteen men made it here; an anti-tank gun and a German heavy machine-gun attacks their flanks. Within minutes eight comrades bite the dust; one losing his life, another an arm; no matter, they have to hold out and, after long hours of struggle, a French regiment relieves these men. The Supreme Command of Allied forces has seen fit to channel our craving to fight against fascism. At three on the tranquil morning of 14 April 1945, our batteries set about punishing the enemy lines, harshly and to effect. 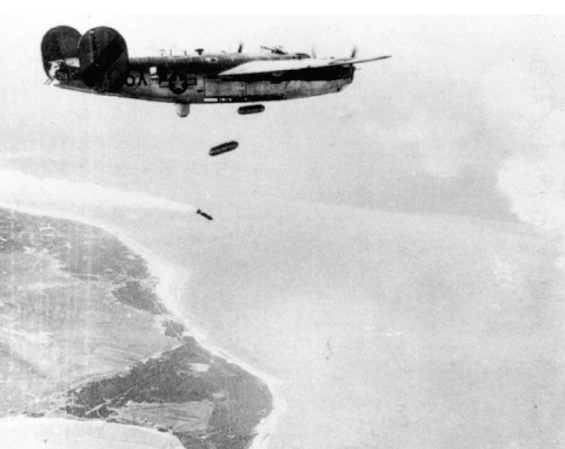 Hundreds of bombers flew all through the morning, bringing death to the enemy camp. At noon, we happily snack. At three in the afternoon our soldiers stealthily moved out. We are to take Hill 40. Morale among the comrades is exemplary. The terrain is strewn with mines, but the advance presses on despite the ferocious enemy fire. Some comrades from the Libertad Battalion, believing the Basques to be in danger, rush to their aid. The operation comes to a happy conclusion, albeit with painful losses and our forces return to base with a fine haul of German prisoners. Deeds of real integrity have been done, demonstrating once again the antifascist steadfastness of our combatants. There was nothing worthy of note to report on 15 April, the daytime hours being spent on regrouping and getting ourselves ready for fresh offensives. At daybreak, after forming up, we set off in the direction of the sea. An operation to bypass Saulat. Our forces arrive at the trail bordering the sea after a long, arduous trek over sand, obliged to suffer the impertinence of a plague of mosquitoes, and done in with weariness. This day we took two Nazi redoubts from the enemy, with just one loss on our side. After yesterday’s forced march, we arrive today within five kilometres of Saulat. The order to attack the Gestapo’s stronghold, bristling with formidable cement fortifications, is anxiously awaited by the comrades. Until the time comes, our guys rest from their past exertions and muster on the road leading into Saulat. The comrades rest easy and pass comment on the situation; there is a lot of optimism and confidence among us. It is two o’clock in the afternoon and I have spent the whole of the morning chatting with the comrades, finding not one single instance of faint heart. Quite the opposite; plans for the future. Somebody brought up our forthcoming Congress and the guide-lines that will come out of that; others laugh and hopeful that the imminent end of the war will trigger events that will allow us to return to Spain; others bring up reports arriving from the rear-guard. There is much enthusiastic talk of the feats accomplished y the Basque Unit and the Libertad over recent days. One Basque officer has just told me that they mean to put it to the Basque government that it look out for some Libertad Battalion comrades who have lost limbs in the fighting on the 14th whilst coming to the aid of their comrades from the Basque Country at a time when the latter were in extreme danger. An act of true humanity and comradeship. Our solidarity in the struggle above all else. The expectation is that the assault on the enemy’s positions will come at 15.30. Come 15.10, the column’s head is filled with enthusiasm and confidence. All morning long, our artillery punished the enemy and the air force has also done sterling work. Come 16.00, our Unit moves out steadily amidst the greatest enthusiasm, to a chorus of Victory to the FAI!, the UGT! And the “TRIBES”. An emotional moment. I moved hither and thither passing on the latest news and egging the comrades on. Our forces have just overrun the first enemy lines and this endorses the Spaniards’ optimism. The Germans may well put up great resistance, but our commitment in conjunction with the Moroccans has them dismayed. In short, it is our intention to take Saulat this very day. 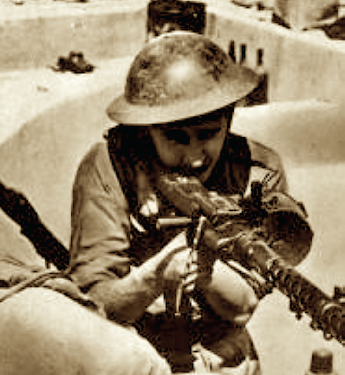 In the late evening, our unit and the Basque one press ahead and the car carrying this modest reporter ran into great difficulties keeping pace with the advance. At the instigation of a French doctor, an outstanding comrade, we swing around to enter Saulat from the far side. We move out and after a few kilometres run into a car hurtling at speed. You can imagine my surprise when we stop it and find two comrades: Barrios, from No 7 Regional; and Pintado, from No 2, on an intelligence-gathering mission. Greetings and hugs all round. A quick run-down on how operations are going and then we part, to meet up again in Saulat later. We have run into great difficulties getting to our objective on account of passage on all the roads having been obstructed by heavy air raids. It is eleven o’clock at night by the time we reach it. The town has been taken and the captain from Company No 2 has toasted the event in the mayor’s house. On both sides, the cannons and aircraft are still operational on both sides and making a great din. Unable to track down the unit, we are obliged to spend the night on the open road. In the early hours of the morning of 19 April, we meet up with the comrades again; among them, there is great satisfaction with the success achieved. The worst still lies ahead of us. The Germans have pulled back from the coastal defences to resist to the bitter end. At half past nine in the morning, No 2 Company moves out to take up its position and prepare the attack with Barrios and Pintado. By noon the Libertad Battalion is back at full strength. At three in the afternoon, the order was a given for an attack to be mounted on a fortified clearing that was an out-and-out fortress; the Germans are putting up very stiff resistance, defending themselves with three cannons and the odd mortar. Our commanders, in a display of spot-on tactics, organized the attack through a daring deployment, wonderfully aided and abetted by our comrades who threw themselves into the attack to ringing cries of Long live the FAI, the UGT and the “TRIBES”. After a ferocious fight, one of our comrades managed to raise the Red and Black flag alongside the French flag on the highest point on the coast, thereby signalling the capture of the position to the greatest enthusiasm. It is 17.50 and a large number of German prisoners have been taken. Next, one section pressed ahead along the left flank, penetrating some four kilometres deep, whilst an advance was made along the right flank, the operation being concluded with the capture of another two bastions with two cannons and a machine-gun. That done, a veritable caravan of prisoners with our comandante marching ahead of them reach our second lines. In the few hours in between, further prisoners are arriving. Having overcome the resistance from the ‘blockhaus’, a section from No 1 Company presses rapidly onwards along the left flank of the occupied positions. They are CNT members to a man. The advance continues to within a few metres of Pointe de Grave which is in the hands of German officers who take up position. Fighting quickly erupts. The German forces are looking down on the position manned by our section and lay down intense machine-gun and anti-tank fire on our men. The response is not long in coming and the skirmish escalates into outright battle. Within a few minutes’ fighting, one of our men drops, wounded in one arm by a dum-dum bullet. Ten minutes after that, comrade Fraga is shot in the leg. Virtually right next to him, another man is shot in the chest. While attempting to retrieve the automatic rifle the wounded man was using, Captain Gomiz takes a bullet in the belly. The wounded are evacuated and the remainder of the section clings to the positions until night falls, at which point the ten men left are relieved by an entire French regiment. So ended that brilliant and triumphant day which ensured that Pointe de Grave was liberated to the loudest cheers for Spain and our beloved organizations, as we are left to grieve for our fallen, who have yet again spilled their blood unselfishly for the liberation of peoples. Negative criticism of the battalion’ performance in the Bordeaux area can be found in the reproaches French officers made to its commander and the rest of the unit’s members: to him regarding his cohabiting with his wife in the army camp and to them about their para-military appearance. We imagine, too, that the anarchist fighters’ obvious lack of enthusiasm for military march-pasts and parades celebrating victory – following the success of ‘Operation Venerable’ – did nothing to improve the French officers’ views. Because, to the disgust of these servicemen, barrack-room bombast has never been to the liking of anarchists. As to their aspect, it seems that French officers were not pleased with the libertarian battalion’s members motley dress, overlooking the fact that this was down to the men’s having been kitted out by the army quarter-masters with old , second-hand uniforms, in contrast to the (slightly better, as we have mentioned) gear issued to the Basques. 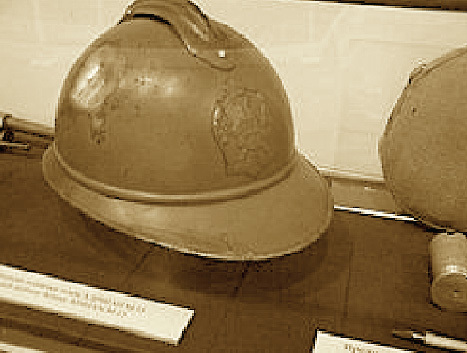 It was the same story when it came to their headgear, with the Gernika being issued with recent British-made helmets (the Mk-Ii helmet, the British having churned out 12 million such units between 1938 and 1944) and the antiquated ‘Adrian’ First World War helmets supplied to the anarchists. To be honest, it has to be stated that the troops fighting in the geographical location with which we are dealing here were among the worst equipped in the new French army being reconstituted during the closing months of the war. 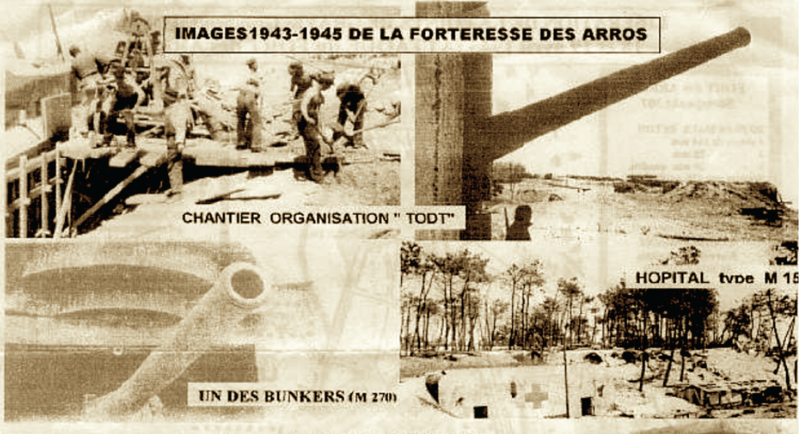 Supply shortages also impacted on other units – banded together into the FFO (the Forces Françaises de l’Ouest/French Forces of the West) posted to the Atlantic coast and tasked with laying siege to the last remaining Nazi redoubts refusing to surrender. Uniforms made of mediocre materials, a motley assortment of helmets of varying designs and vintages – and most of them seized from the enemy – were the identifying feature of those units and led to their being sneeringly referred to as the FFO (Forces Françaises Oubliées/ Forgotten French Forces) due to the short supply of the gear issued to them. Photo: Libertad Battalion fighters after capturing a blockhouse used for artillery, possibly in Soulac-sur-mer. One would hardly have expected any other opinion from that veteran guerrilla who was doubtless offended by the independence of the Gernika Battalion – which he himself had founded as the Basque Brigade – and of the Libertad, which emphatically rejected absorption into the Agrupacion de Guerrilleros Espanoles. But comparing the efforts of that communist unit (we imagine his reference was to the 31st Brigade) wit those of the libertarian unit is out of order, given that at the time of the liberation of Bordeaux the anarchist guerrillas were far away from the Gironde, harrying enemy troops in the distant Lot-et-Garonne department. As we pointed out in the first instalment of this study, the (24th AGE Division-attached) 31st Brigade under Madrid-born Eduardo Casado aka Barbas was operating in the Charente Maritime department before being switched to Les Landes where, in June 1944, it thwarted the arrival in Bordeaux of German reinforcements by cutting off the highway and railroad line connecting Bayonne to the capital of the Gironde department. It subsequently took part in the drive against the Germans occupying the Bordeaux district before being transferred again to the nearby Pointe de Grave front, where it served from September to November before being moved again to the Gers department. But that happened during the second semester of 1944, at a time when the Libertad Battalion was not in Bordeaux and it would be months before the launch of the April 1945 final push in which the CNT combatants did take part. It is obvious that Vicuna’s criticism of Santos’s men is – to say the least – unfair, in that there can be no comparison between the fighting history of the two units at a given time and place, if one of them was not fighting in the area cited until months later. The communist guerrilla Vicuña’s view was not shared by Ordoki’s group, the members of which were on good terms with the anarchist fighters I that they were all assigned to the same French unit (1st Foreign Volunteer Battalion, attached to the 8th Mixed Moroccan and Foreign Regiment – RMME) and fought together in the final offensive of mid-April 1944. Her exclamation, of course, spoke of the resignation with which the French population of the Gironde department had greeted the German invasion, as had many of the inhabitants of the rest of Aquitaine, in the coastal areas of which resistance was muted thanks to the presence of the Gestapo and the close surveillance from the German troops. According to other testimony, the commitment displayed by the anarchist unit was undeniable. As they advanced they captured – in quick succession – the defensive positions of the German rear-guard, sweeping past them and on to the ones erected along the coast, where they found many of the blockhouses demolished or buried in the sand as a result of the air raids mounted against the German redoubt in Pointe de Grave. The massive air-raids struck most of the targets and the part they played was key to the onward march of Carnot’s forces in the direction of Soulac-sur-Mer and Le Verdon. 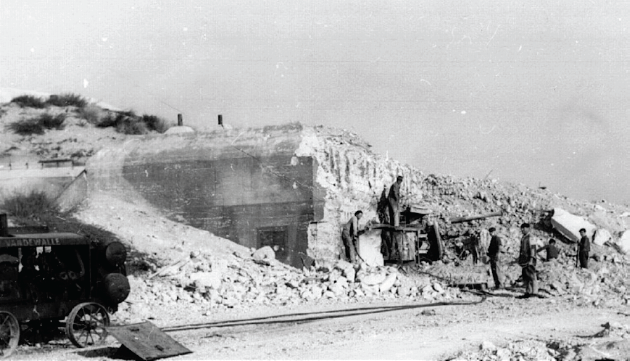 Even if they did not bring the reinforced walls of the casemates down, they did damage their concrete shell which covered only the outer surface of the buildings. Unlike the ones erected on rocky ground, the soft, sandy soil on the beaches – where most of them were located – made them more likely to be collapsed by the shockwaves from explosions, since their footprint did not extend beyond each fortification’s floor surface. This factor acted in the favour of the anarchist fighters because, with the gun-muzzles knocked out of position by the air raids, the blockhouses’ fire-cover area was impaired. This made it possible to crawl over to the half-demolished constructions and lay siege to hem until the garrison inside was obliged to surrender. This came at a high price. Dozens were wounded and in the Libertad’s very last operation in the war as a fighting unit, the lives of four of its men were lost. We only have details of two of the four. And as for the survivors, we have forenames and surnames for only a few of them. “Libertad” Battalion. These men are from the “maquis” and, prior to the “maquis” from the glorious columns of volunteers that stood up to the mighty onslaught of international fascism on Spanish soil for three years.